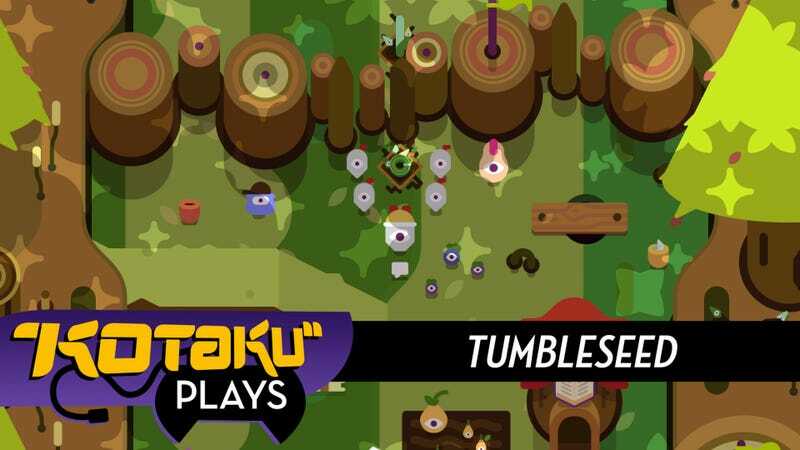 TumbleSeed is a game where you guide your character forward on a seesaw-esque swing on a journey to scale a hazardous mountain. We play the first twenty minutes in this Kotaku Plays. TumbleSeed has two sides. On the one hand, it offers a friendly world of cute monster pals and relaxing music. On the other, it gives you tricky explorations. To move, you tilt a small seesaw-like contraption to slide across the screen. It’s both intuitive and difficult to gain a grasp of. As a core mechanic, the idea is really cool and makes a lot of sense; getting your muscles to obey is another thing altogether. There’s some charming stuff to be had here though. Random hazards keep your on your toes and the mood is remarkably subdued. I’m eager to sit down and play more. I just imagine it will take a while for me to stop tilting and tumbling all over.